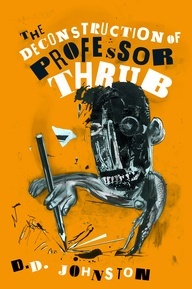 My new novel, The Deconstruction of Professor Thrub, is due to be published in two months, and the preview copy looks damned chic. The cover is by Rawshock Design, using an illustration by Ian Pollock, and Mike Gower has done a brilliant job with the typesetting (you’ll see as soon as you flick through Thrub why the typesetting was such a tough job). It’s being published by Barbican Press at a very reasonable £12.99. A student has the themes for his creative writing PhD. He pins them to Elsie Stewart and embarks on her biography. Love takes Elsie to the Spanish Civil War while the story hurtles off into the maelstrom of Ukrainian twentieth century history. Can Professor Thrub’s post-structural guidance haul the project back on track? Will love and surgery redeem our student’s struggles for a good life, significance and a doctorate? This biting comedy of love, desperation and existence offers a thrilling ride into the world of a major new writer.